"With the MB crusher bucket, we are doing the entire processing by ourselves. Moreover it's a very convenient machine for our business." Why did they choose to buy the MB Crusher bucket? The answer is very simple! "A license for a traditional crusher machine is very hard to get, you need connection and lot of money to use it...on the contrary MB crusher bucker is a very convenient machine." But there're also other very important reason why they chose MB: "In the past we had to pay to dump excavated products in landfills. And then we had to buy base course for asphalt and road construction project. Now, with the MB crusher bucket, we are doing the entire processing by ourselves. Currently we're using MB attachment 8 hours of work 5 days per week. We are crushing our own base course and we can choose between different ranges of output for our road construction". "Moreover I can say that MB crusher bucket it's a very convenient machine for our business because having a traditional machine for our size is not justified, plus it is very hard to get a traditional crushing tool. We had an old machine that we were planning to reject and replace. However, instead of rejecting it, we invested in MB crusher and now we are keeping to do the job. No need for excavator to travel, it is positioned efficiently. Finally the operator is very happy with the machine. It does not vibrate the machine like a hydraulic breaker, no problems at all so far." Al Israa is reknown contractors in the South of Lebanon. 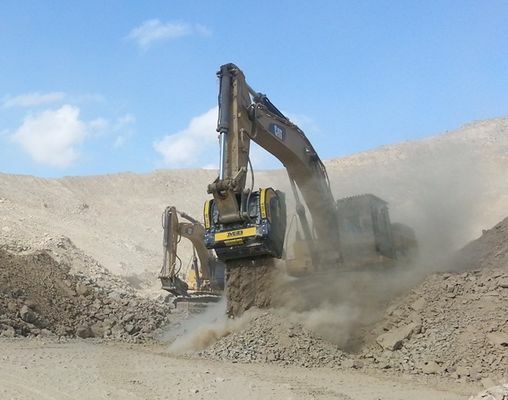 They're dealing with excavation, they own an asphalt plant and they are involved in road construction activities, operating with more than 15 machines. "Having a crushing plant is hard and sometimes crushing plants are not allowed to work. However, MB provided us with a great and feasible solution. It helps a lot in our work and the operator can at the same time crush the material and fill the truck. MB crusher bucket is producing on average 6 trucks(20m3/each) per day, working 8hours/day, 6 days/week. The material that has been crusher is sourced from excavation on different locations resulting from the work of a hydraulic breaker. We're currently is crushing excavated material into base course. So, instead of paying landfills to dump material, they can now crush it and use it as base course... so it is a cycle! " I can say that our MB crusher bucket is operating for 4 month now, we had no problem faced., it's a very great machine!